Holloway Sanatorium – garish or gorgeous? 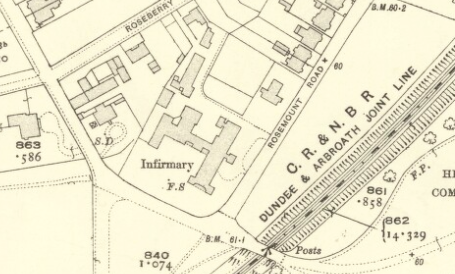 Arbroath Infirmary consists of a pleasing if mismatched group of buildings in a variety of dates and styles. The oldest is the former Rosebrae House, probably dating to around the 1830s-40s. The original infirmary of the 1840s was demolished to make way for the present main stone building, erected in 1913-16 and added to in the 1920s and 30s. Most recent of the additions is the Queen Mother Wing of the 1960s. As well as medical and surgical cases, the infirmary was open to accident cases and also to those suffering from contagious diseases. It was a handsome building, in the fashionable simplified Tudor or Jacobean style much in vogue for domestic villas, and apart from its rigid symmetry, was barely distinguishable from a private house. David Murray, mason, Forfar and Messrs Nicol and Wallace, wrights, Arbroath won the building contracts. Local sandstone was the main building material, faced in ashlar on the main elevation and the side returns, but brick was used for internal walls. ‘Arbroath pavement’ was used to floor the service areas, with polished stone for the stairs, and timber for the ward floors – ‘Petersburg battens’ on Memel pine joists. Doors and windows were of American yellow pine, and Easdale slates covered the roof. Natural ventilation was introduced through fresh air flues within the walls, carried behind the skirting boards with vents into the wards. Ornamental openings in the ceilings connected to flues carried through the rear wall to extract foul air. Bristowe and Homes’s account of the Hospitals of the United Kingdom, published in 1866, described the infirmary as it then existed as a single, long building of two floors with the kitchen and offices built out behind. By then the original accommodation had been extended to the west, almost doubling the number of beds that were provided, from thirty-six to sixty. This postcard shows the extended infirmary, with the new wing to the left in the same style as the original building. Reproduced by permission of D. Robertson. This old postcard shows the extended infirmary with its encircling wall, railings and entrance gates. Reproduced by permission of D. Robertson. Despite the additional wing, by the end of the nineteenth century there was a pressing need to provide more accommodation to meet the needs of the growing population of Arbroath. Unusually, the new hospital was largely constructed during the First World War. Plans by the local architect Hugh Gavin were drawn up by June 1912, but the estimates exceeded the expected upper limit of £12,000 by £2,500. This meant that more money had to be raised, but also prompted some of the infirmary managers to question whether a new building should be built at all, or whether it would be better to find a different site. It was largely for these reasons, and, once they had settled on rebuilding on the existing site, finding a temporary home for the displaced patients and staff, that delayed the start of construction. Postcard showing the same view, perhaps around the 1930s when the children’s ward to the left was newly completed. Reproduced by permission of D. Robertson. Arbroath Infirmary, photographed in April 2018. © H. Richardson. The open sun veranda at the end of the ward to the left has only recently been enclosed at first-floor level. Estimates submitted by the various tradesmen for the erection of the new building were considered in March 1913 and were awarded as follows: mason works Messrs Christie and Anderson, builders, Arbroath, £3,775; joiner work Mr Rowland, Chapel Farquhar, joiner, Arbroath £1,828 17s 6d; plumber work Mr Thomas Raitt Grant, plumber Arbroath £1,148 15s 11d; slater work Messrs William Brand & Son, Slaters, Arbroath £191 16s 7d; plaster work Mr Archibald Donald Senior, plasterer, Arbroath £521 2d 4s; tile work Messrs Robert Brown & Son Limited, Ferguslie Works, Paisley £401 8s 2d. The new infirmary was almost finished before the outbreak of the First World War, but it took two more years before it was ready to receive its first patients, as it became increasingly difficult to source materials and workmen. Furniture was acquired late in 1915 from George Rutherford Thomson and Son, cabinetmakers. Bedsteads were separately supplied by Messrs J. Nesbit-Evans & Co. of Birmingham. Despite hopes that the new infirmary would be ready for patients early in 1916 it was April when it was officially opened, and June before the first patients arrived. With the war still raging, it was clear that beds should be set aside for war wounded. At the outset of the war 30 beds at Greenbank had been offered to the Red Cross Society. On the left is Rosebrae House and to its right the nurses’ home. Photographed in April 2018 © H. Richardson. After the war the infirmary directors turned their attention to additions to the buildings. In particular there was a need for accommodation for the nurses and for the resident medical officer. Sketch plans were made by Gavin in 1922 for a new nurses’ home costing around £4,000, and the home was completed by March 1924. This view looking towards the nurses’ home has Rosebrae House on the left and part of the 1913-16 hospital on the right. Photographed in April 2018 © H. Richardson. The next addition that was urgently required was a children’s ward. Plans were prepared in 1925, but differences arose between the medical staff and the infirmary directors. In April the medical staff submitted their views to the directors. They agreed that a children’s ward was needed, but pointed out that there was an equal need to provide space for maternity cases, cases of venereal diseases, and out-patients. ‘… year by year the Public are demanding an increasing number of hospital beds for the treatment of general medical and surgical diseases. We are in agreement with the Directors that an extension of the hospital is required, but we view with regret and misgiving a proposal to provide one of those departments, in this instance the Children’s Ward, according to a plan which seems to us to be essentially unsound, and, of even greater importance, which blocks one of the natural paths of extension of the hospital. The whole question of extending the infirmary was referred back to the building committee and the position of the new children’s ward revised. However, the deepening economic depression of the 1920s, the Second World War, the building restrictions in the years after the war, and then the transfer of the hospital to the National Health Service in 1948, meant that all the new facilities were only provided with the opening of a new wing in 1961. The diminutive Rosebrae House on the left, with the south end of the children’s ward block in the foreground. Photographed in April 2018. © H. Richardson. For the children’s ward, advice was sought from John Wilson, the chief architect to the Scottish Board of Health, who judged a competition for its design in 1928. Thomas W. Clark, architect of Arbroath, came first, James Lochhead of Hamilton was placed second, and Charles S. Soutar of Dundee third. After criticism from the medical staff, Wilson and Clark amended the plans, and the new wing together with additional accommodation for the nursing staff were built in 1930- 33. Rosebrae House, which adjoined the hospital to the west, had been purchased in 1928 and was used for stores and to accommodate the night nurses. Although the work began under Clark, he resigned part way through the commission, perhaps as a result of conflict with Wilson. James Lochhead, the runner up in the competition, took over the commission. As to the 1961 wing, this comprised consultative out-patients department, physiotherapy department and maternity unit. The total cost was £90,000 of which £53,000 came from the Board of Management’s Endowment Funds. The Queen Mother Wing, built 1958-61 to provide for out-patients, maternity and physiotherapy departments. Photographed in April 2018. © H. Richardson. The architect to the Eastern Regional Hospitals Board, James Deuchars, and the regional engineer, R. G. McPherson, drew up the first set of plans for the wing back in 1952, although the building was only put out to tender in 1958. The building contractor was R. Pert & Sons Ltd of Montrose, the clerk of works, Mr Groves, and the engineer in charge, Mr Moodie. The Angus Hospitals Board of Management blamed delays in construction on a lack of collaboration between Duechars and McPherson, an accusation hotly denied by the Eastern Regional Hospitals Board. Detail of the Queen Mother Wing. Photographed in April 2018. © H. Richardson. Later work on site, including a new X-ray department, was designed by Baxter, Clark and Paul in 1968. I am an architectural historian. I worked on the Survey of London from 1991-2018, and am an honorary senior research associate at the Bartlett School of Architecture, UCL, and an honorary fellow of the University of Edinburgh. I have worked on surveys of hospital architecture in Scotland and England. This entry was posted in General Hospitals, Scottish Hospitals and tagged Arbroath, general hospital, post-war architecture, post-war hospital buildings, Scottish Architecture, voluntary hospital. Bookmark the permalink.